Has time really passed so quickly? 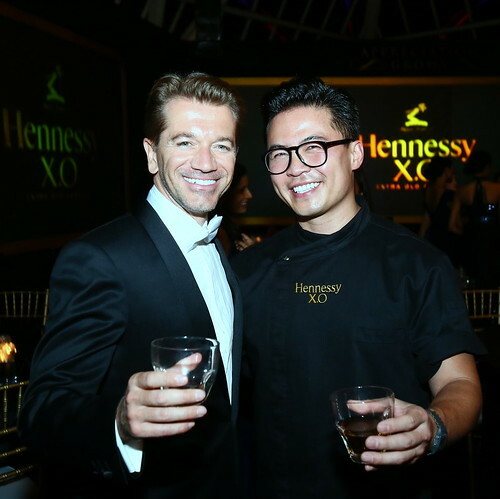 Hennessy Appreciation Grows is no stranger to those in Malaysia or to those who read this blog. This year, Hennessy Appreciation Grows 2014 would take us to the south of West Malaysia. 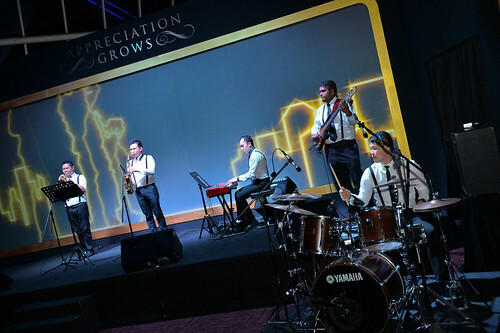 Taking place for the very first time in Johor Bahru, men in bow ties and women in evening gowns, boarded a cruise liner at Danga Bay ‘dock’. Themed the Spirit of Conquest and set in the late 19th century, this luxury cruise ship would voyage to France and several iconic countries around the world, tracing Hennessy XO’s footprints in time. 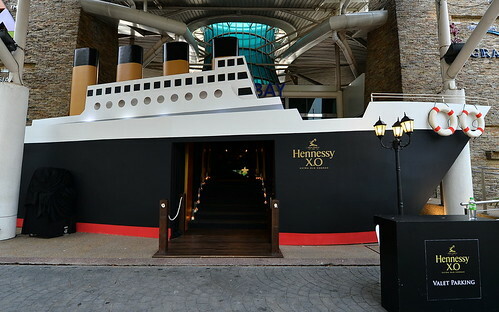 Before setting sail on our gastronomic adventure, we were ushered into a lounge, to rekindle our tastebuds with the unique aromas of the rich & velvety flavours of the Hennessy XO cognac, hosted by a Moet Hennessy Spirits Ambassador. For this particular dinner, the sailing ship would have a new Chef de Cuisine. Viet Pham is the award-winning chef and co-owner of Forage Restaurant in Salt Lake City, Utah. Originally, born in Malaysia’s boat people refugee camp and then relocated to the US at just 5 months old, Pham grew up in the San Francisco Bay Area and graduated from California Culinary Academy in 2002. Pham interned at Michelin-starred Fifth Floor Restaurant in San Francisco, CA under Food & Wine Best New Chef 2002, Laurent Gras. He has also appeared on the television reality program, Food Network Star, and Iron Chef America. 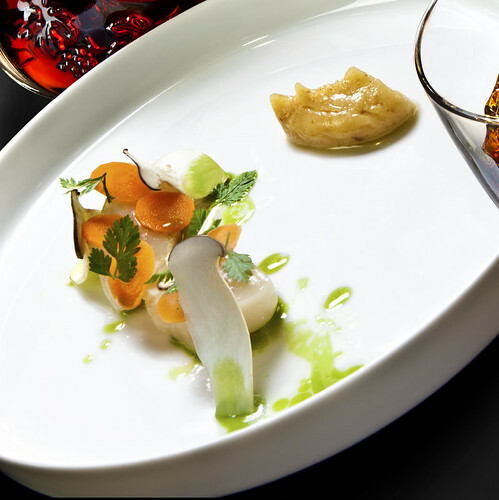 Being a three times James Beard semi-finalist for Best Chef: Southwest, and awarded Best New Chef by Food & Wine in 2011, would Pham’s culinary brilliance serve us the ultimate Hennessy XO cognac pairing with fine foods? We would soon witness this for ourselves. The gastronomic journey disembarked from Johor Bahru to our first port of call, Paris, France – the birthplace of the Original X.O in 1870. The first dish of the night, was a simply delightful composition of fresh scallops, lightly roasted, accompanied by a buerre, that tasted of pungent caramelised onions. This paired well with the Hennessy XO with water. I liked the scallop just on its own, as it was incredibly fresh. The strong oaky flavour of the cognac however, matched the equally strong flavours of the buerre of almost burnt cream. As this first dish unfolded, guests were entertained by a wonderful troupe of dancers showcasing a signature French cabaret dance. Our journey continued Eastwards to the Orient, arriving in China in 1872. If there was one thing that stood out during the dinner, it would have to be the way in which Chef Pham presented all of his dishes. Loved the creativity of this next one – a highly concentrated, thick japanese mushroom mousse was a flat base, on which a perfectly poached duck egg sat. 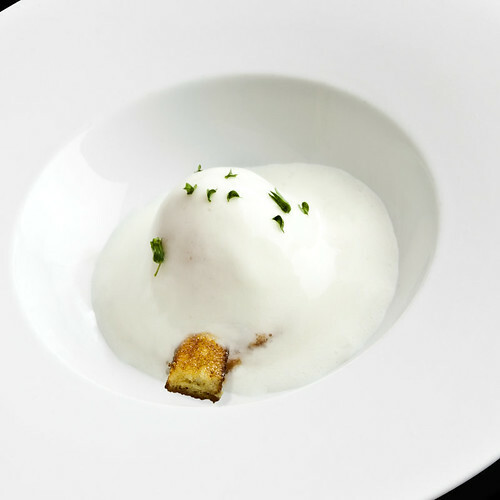 The mushroom mousse exuded strong flavors on the palate, while the crunchy bits of grain added texture. These strong flavours, paired well with the Hennessy XO neat. The only problem was that there was too much salt in this dish, making it impossible for some to finish. No wonder we knocked back so much XO then! This part of the journey was accompanied by some smooth tones of a Shanghainese vocal jazz singer. Our next destination was to the West, to America. Arriving at a time in American history known as the Gilded Age, Hennessy X.O made its timely debut, as an elegant and sophisticated tipple, that went well with any occasion. 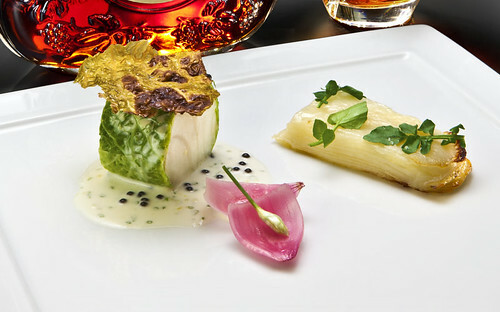 The dish was explained as a tribute to the Great American Dream and although we couldn’t see the American connection with the fish and the prized Russian caviar, the dish was beautifully presented. Taste wise, it was a bit of a let down, as the fibrous Savoy cabbage which was possibly undercooked, made it too tough to cut through, let alone bite into. We did enjoy the fresh sea bass and the caviar sauce though, which went down well over the smooth, silky tones of a jazz quintet. From America, we moved on to the shores of Italy, a country where cuisine and culture ignite strong passions. 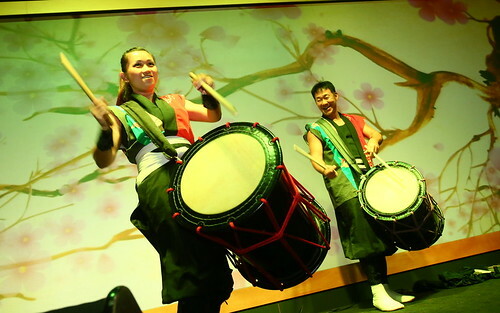 An opera performance heightened our senses, setting the dramatic entrance of the Spicy Mediterranean. 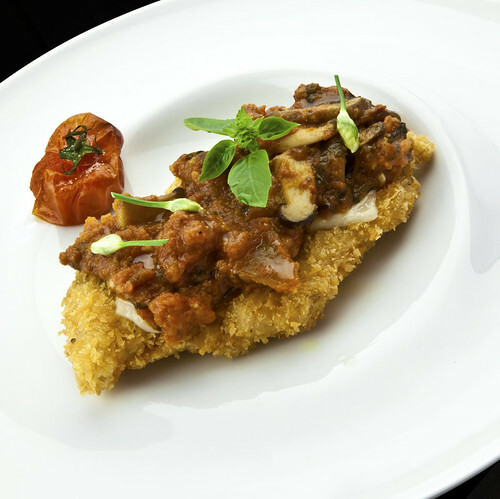 It was Chef Pham’s take on chicken parmesan (Pollo alla Parmigiana) – an uncomplicated dish that was accompanied by Hennessy X.O and water. While the Yellow River Richness totally raised the bar on our dining experience, this spicy Chicken Parmesan was a complete let down. The ragu was simply too concentrated, and the chicken breast overcooked. Unfortunately, this was a tough one to stomach. As we approached our journey’s end, guests found themselves back in East, in The Land of The Rising Sun. This final dish called the Osaka Bay Freshness, fortunately enough, was the saving grace for the night, especially after the previous let down. A cold dessert of Japanese salted plums and citrus fruit flavours with crispy biscuits was as gorgeous to look at, as it was delicious. A palate cleanser that won over many diners you can be sure. It was the perfect food cognac pair with the XO with water. 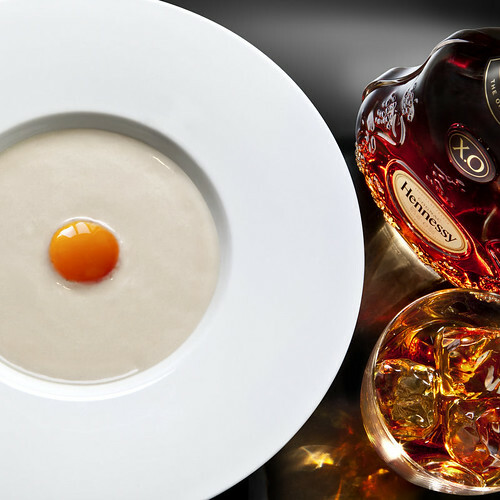 All in all a great night of gastronomy and food-cognac pairing. A lot of thought had definitely gone into the programme that night. There were some hits and misses, but we are sure that Chef Pham’s creativity will keep growing from strength to strength. We hope to see more of him in the coming year.